I’ve been hoping to see some morris dancing, it being May and all. And perhaps maypole dancing even. So good to see the return of green leaves and light evenings. The light at this time of the year makes me feel a bit giddy. Everyone should be singing and dancing about. Most of us probably won’t don bells or dance around a maypole, but it’s rather grand to see other people doing it. 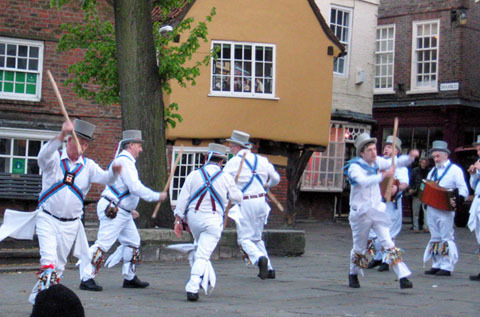 I did research whether anything like this was taking place in or around York during the bank holiday weekend, I couldn’t find anything nearby, and this was probably just as well, as nearest and dearest don’t share my enthusiasm for watching men in white wearing bells and banging sticks together. I went for a walk this evening to take pictures of King’s Square, and chose evening as I thought it would be fairly empty. The light was fading as I walked up St Andrewgate and I realised I should have got out a bit earlier, and started feeling a bit grumpy. 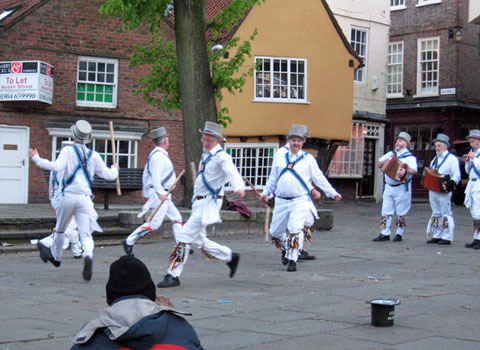 But then as I walked I could hear an accordion, and familiar morris dancing type sounds, which I didn’t think could be real morris dancing, in King’s Square, in the evening. But it was. Very few people watching, those watching looking a bit bemused. One man recording it on his phone. And them, leaping about, performing choreographed manoeuvres with sticks. Under a newly-leafed tree. Thank you Morris men — marvellous.